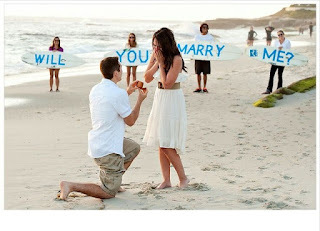 Let’s start with the true basic things required for a perfect proposal. A perfect engagement ring and a perfect moment to break it in front of her. To find a perfect beautiful engagement ring requires knowledge of your prospective spouse’s choice in style and fashion. So there are a lot of options to choose from, at Amcor design. Talking about perfect moment, there is no such thing like this and it just won't come to you like that, but you have to make a moment perfect either by taking her out to a very special place where she likes to be and break the proposal in front of her or by just make the moment special with diamond engagement ring. Michael Benson and Ana Rose went on a scuba diving date on a weekend when Michael promised to take her to the shark lands. And just when the couple were all surrounded by sharks Michael broke the proposal and took a white board with “will you marry me?” written on it. Ms Rose responded with the OK Sign underwater. Later,back on the boat Michael Gifted Ana a diamond engagement ring. Ashley rose, Minneapolis news reporter got a call for the job, she just had to read a few lifestyle news on television, when suddenly in between her boyfriend came in with a beautiful diamond engagement ring and proposed her on air. Which she replies with yes. Anna Hamburger and Memo Chang, used to be new york residents, went on a walk in Central Park on a christmas morning. Everything was just normal when Momo held Anna’s eyes from behind and told her that there’s a surprise. While anna was totally clueless, Momo removed hands off her eyes and let her see a beautiful diamond ring hung on a christmas tree. Anna agreed to the offer and they are leading cheerful wedded life. Pooja, Californian Geologist was staying a weekend at her boyfriend’s place. On the morning when she was to leave for work. Justin made her breakfast, sandwiches and coffee. When pooja took the last sip of coffee from that cup she saw justin got “marry me” written in the bottom of that cup. She said yes instantly. Steven, a space nerd made his way in NASA with his intense brain working capability and sharpness. Steven decided to propose his highschool girlfriend from space. So he took off in one of the mission and made a video with space in the background and online telecasted the video for the whole world to see. His woman, natasha gave him a call in space during the video saying yes to the proposal.